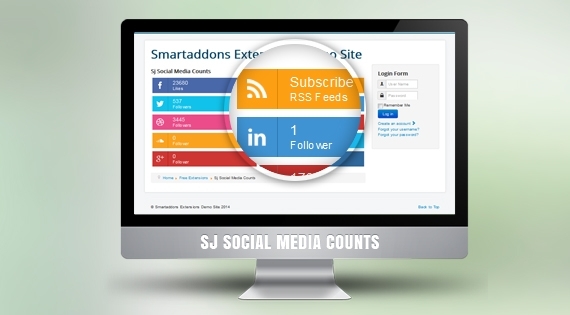 SJ Social Media Counter - The fastest way to socialize your site has been released. This module is a great and easy to use module that performs counting Facebook fans, Twitter followers, Dribble followers, SoundCloud followers, YouTube subscribers, Google Plus page followers, LinkedIn followers, Vimeo followers, Instagram followers... You can also choose to show a link to the RSS feed of any pages. All you need to do is install, choose module position and set the social link, your social media link will be displayed as the list with nice buttons. The Admin Panel is clear, intuitive and easy to understand, you can create your own social media and put it any position you want. It will automatically adjust its size to fit correctly. Let check SJ Social Media Counter tour right now to feel more!